Google updated the music search OneBox, which used to include song titles, album names and some other information licensed from AllMusic. The new music search OneBox is only focused on finding music, previewing songs and easily buying them. Search for an artist, an album name or even some lyrics and Google returns a list of songs that can be played with one click. Full music previews are provided by iLike and Lala, but Google also links to other music sites: Pandora, Rhapsody and imeem. When you click on a music result, Google opens a player in a pop-up window, which isn't very user-friendly. "With Lala, you can hear one full length preview per song. Each subsequent play will be a 0:30 clip," explains Lala. This limitation is very easy to bypass: just clear the cookies for lala.com. Google says it will be "rolling this feature out gradually to users across the U.S. over the next day". Not wanting to feel left out, Yahoo reminds users that it launched a similar feature last year. "Since launching a partnership with Rhapsody in September 2008 and launching the FoxyPlayer last year, music has been an integral part of the Yahoo! Search experience as well. We have found that nearly 6 percent of all Yahoo! 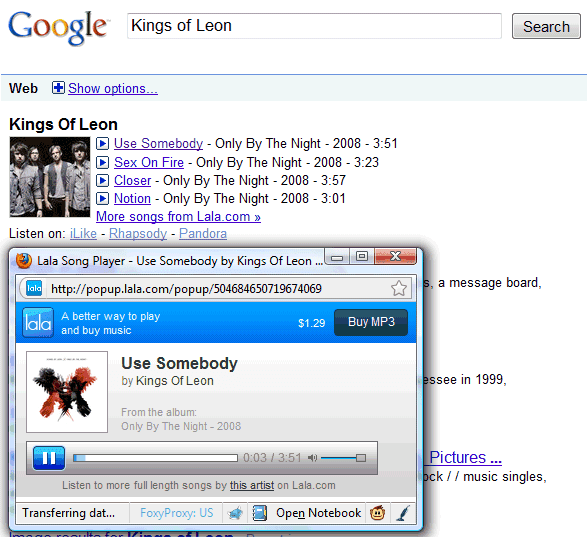 searches are music-related." Definetly a great idea just hope it works as good as it sounds! It's very nice trick, we like it. This sounds pretty exciting and convenient! It gives the search engine an opportunity to harness some of this traffic as well as steer it in the direction of Google's choice. That's because it's only available in the US. I hope this tool can help me find all the old songs i grew up with! Nothing like revisiting those oldies. Great feature, I love Google for bringing stuff like that. It provides the search engine a chance to tie together some of this passage and steer it in the path of the choice of Google. I'm more concerned with Google Instant and how it flickers to epileptic proportions when keying in new search terms nowadays. Saying that it wants to bring music fans closer to your favorite artists, Google has added a new Music Search OneBox to its search results. This is cool for Album Cover search.